No matter whether you’re a coffee or tea person, Podgorica and its caffeine/theine outlets have you covered. Our locals know the best cafes and tea rooms to relax and recharge, get productive or enjoy your free time with your favorite beverage… or you may discover local preparations and completely different new drinks. Multinational chains can’t hold a candle next to our locals’ favourite coffee shops. Check them out! “BIRO” in Bokeška street is a perfect place to enjoy a coffee or beer. What makes it stand out for me is its lush garden out in front. My fav in the area! “Bokeška Street” in Podgorica is a place to be for locals. This small street is no longer than 30 meters, but it’s a must for coffee & all-day relaxation. 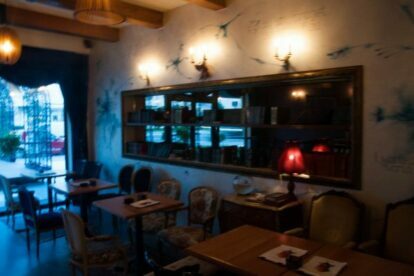 “Bukowski” in Podgorica is a beautifully, smartly decorated bar. I expected something more… mischievous, but this bar still managed to surprise me. “Cafe Berlin” in Podgorica is one of the city’s most popular bar/cafes. It’s very friendly, and that’s where very party in the city starts and ends up at. “Caffeine” in Podgorica is one of my favorite coffee places. I like to spending time on their terrace, as well as enjoy their special cocktails!